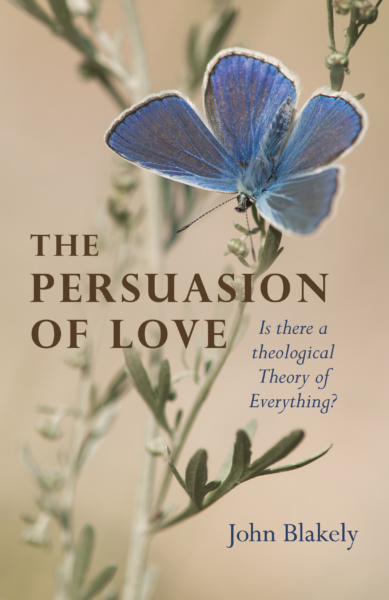 Publishing 29th March 2019 by Circle Books (imprint of John Hunt Publishing Ltd) The Persuasion of Love by John Blakely. The Persuasion of Love examines the implications of believing that ‘the meaning of the universe is love’. It is axiomatic that the Christian faith is about the love of God, but John Blakely seeks to delve behind this easy assertion by proposing that all human love has God as its source, even if marred by human failings, and by exploring what it might mean for God to have created out of love. Viewing theodicy through the lens of love, the book finishes with a lyrical reflection on the fact that suffering is built into the universe because of its source in the love of God, and that we live in the ‘now and not yet’ – in tension between the glory of creation and the agony of the cross, before the future glory of the new creation. Deep theology and philosophy written in an engaging and non-technical style. Approachable but with no dumbing-down, John Blakely risks asking some of humanity’s most profound unanswered questions. A Christian writer, with a particular interest in theodicy and the theology of creation, John Blakely is also a professional classical pianist and accompanist teaching at the Royal College of Music. He is the author of God in the Dark, published under the pseudonym Peter Longson. He lives in Beckenham, South London, UK.